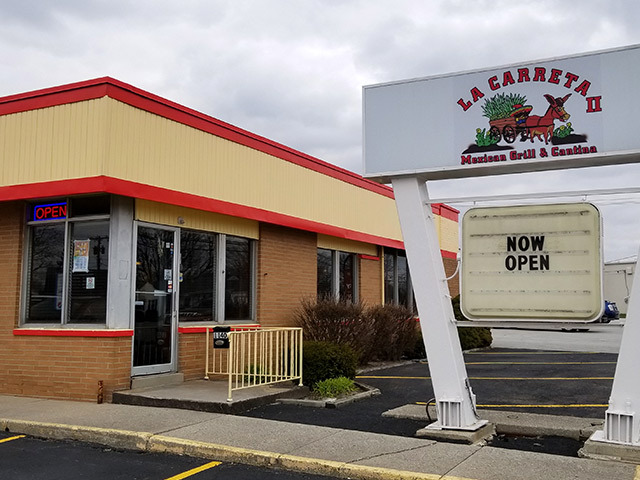 Bienvenidos Amigos to La Carreta II Mexican Grill & Cantina - Authentic Mexican Food in St. Marys, Ohio! 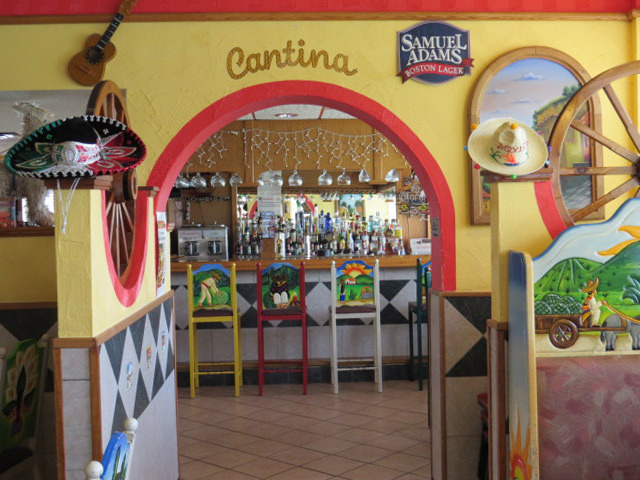 Authentic Mexican Food in St. Marys, Ohio! Beef, chicken & beans topped with lettuce, tomatoes, guacamole & sour cream. Choice of steak or chicken & grilled vegetables. Stuffed with mushrooms or spinach. A mix of American & Mexican appetizers. Two chicken fingers, two cheese sticks paired with quesadilla dip and sour cream. Great for sharing! Grilled steak or chicken on a bed of fresh lettuce, tomatoes, cheese, bell peppers & onions. Choice of dressing. Chicken broth with shredded chicken, strips of fried tortilla, rice, pico de gallo & fresh avocado. 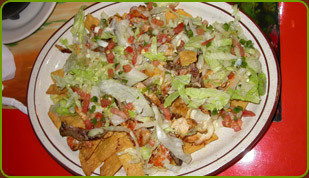 Fried tortilla chips, blended with our special ranchero sauce & topped with chicken or beef & cheese, lettuce, guacamole, rice & pico de gallo. Scrambled eggs with mushrooms, served with rice, beans & tortillas. Fried eggs with chorizo. Served with tossed salad, rice & tortillas. Scrambled eggs with bacon, served with rice, beans & tortillas. Scrambled eggs with ham, served with rice, beans & tortillas. 2 fried eggs with ranchero sauce, served with rice, beans & tortillas. Served between 11:00 a.m. to 3:00 p.m. – Monday thru Saturday Only. 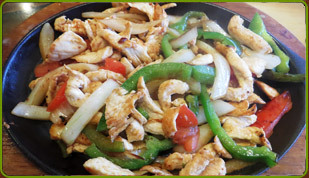 Flour tortilla with your choice of steak or chicken strips, cheese & grilled vegetables. Served with sour cream, guacamole, pico de gallo, beans & rice. 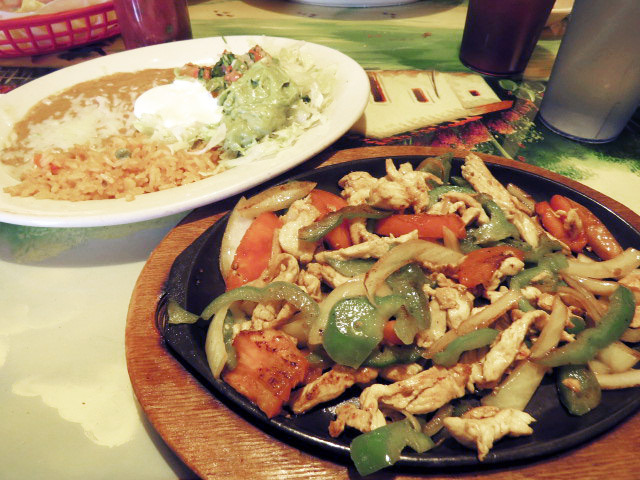 Tender sliced beef or chicken cooked with bell peppers, onions & tomatoes, Served with rice, beans & tortillas. 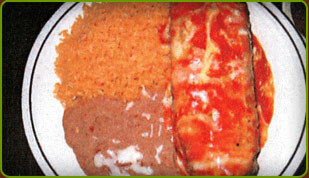 Taco, enchilada & choice of rice or beans. With ground beef & beans, topped with cheese. Tender pork & our green tomatillo sauces gives this burrito its great taste. 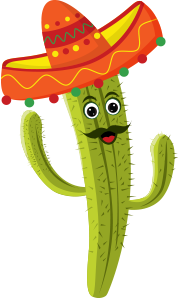 Topped with cheese, served with rice & pico de gallo. Cooked with mushrooms & onions & topped with cheese sauce. Served with rice, beans & tortillas. Topped with ranchero sauce. Served with rice, lettuce, pico de gallo & tortillas. Served with rice, guacamole salad & tortillas. Stuffed with shredded beef, scrambled eggs & beans. Topped with cheese sauce, lettuce, sour cream & pico de gallo. Flour tortilla filled with chicken, beef, beans & rice then covered with beef tips, salsa ranchera, cheese & sour cream. Seasoned tender pork wrapped in a soft tortilla & topped with authentic green sauce. Served with rice & beans. Your choice of steak or chicken, cooked with grilled onions & topped with cheese sauce, lettuce, pico de gallo & sour cream. Served with rice & beans. Chicken strips grilledwith pineapple and chorizo (Mexican sausage) topped with melted cheese, served with rice and tortillas. Beef Burrito, rice & beans. Chile relleno, taco, rice & beans. Chicken or beef Chimichanga topped with sour cream & guacamole salad. Served with rice & beans. 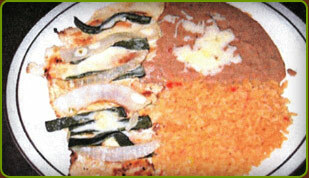 Chalupa, chile relleno & rice. Cheese quesadilla, beef enchilada & chalupa. 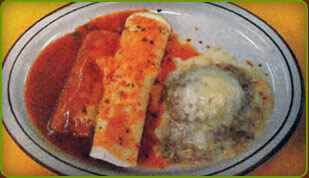 Three enchiladas with your choice of chicken or cheese, topped with green sauce, cheese dip & sour cream, Served with beans. 5 enchiladas: 1 beef, 1 chicken, 1 shredded beef, 1 bean & 1 cheese, topped with cheese, lettuce, tomatoes, sour cream & ranchero sauce. 3 enchiladas stuffed with seafood & grilled onions served with rice, lettuce, pico de gallo & sour cream. Choice of red or green sauce. Crispy flour shell with beans, lettuce, tomatoes, cheese, Sour cream & guacamole. Choice of ground beef, Chicken or beef tips. A crispy flour tortilla filled with beef or chicken, beans, lettuce, sour cream, guacamole, cheese, tomato & pico de gallo. Beef or chicken. Served with rice, beans & cheese sauce. 2 flour tortillas deep fried, filled with shredded beef or chicken, Topped with lettuce, tomatoes, sour cream, nacho cheese, red sauce, guacamole & beans. 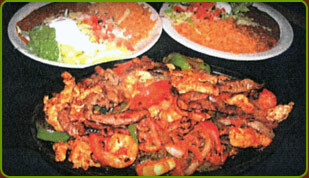 Steak, chicken, shrimp & chorizo, cooked with onions, tomatoes & bell peppers; served with rice, beans, salad & tortillas. Three corn tortillas filled with shrimp, covered with cheese sauce and served with rice and beans. Grilled vegetables: peppers, mushrooms, onions, tomatoes,broccoli and rice or beans. Spicy chorizo sausage and cheese stuffed between two flour tortilla andgrilled. Served with lettuce, pico de gallo, guacamole and sour cream. Order of 4 fried corn taquitos (2 beef, 2 chicken) served with lettuce, guacamole, tomato & sour cream. Chalupa, chile relleno, enchilada, beef taco burrito, rice & beans. Beef flauta, chicken Chimichanga, rice, beans with salad & pico de gallo. A loaded plate of grilled shrimp, steak & chicken strips, served with rice & beans plus a dish of pico de gallo for you to spread on top! Tender grilled shrimp, steak and chicken on top of a bed of tortilla chips, topped with shredded cheese, lettuce and pico de gallo. A tasteful combination plate of one Chile Poblano, one grilled steak or chicken quesadilla & seven grilled shrimp. Served with rice. Two grilled chicken breasts topped with ranchero sauce, grilled onions & grated cheese. Served with beans, rice & tortillas. Grilled chicken with chorizo and grilled tilapia fillet. Served with beans, rice, pico de gallo & melted cheese. Grilled chicken breast cooked with onions, mushrooms, zucchini, tomatoes & topped with melted cheese. Served with beans, rice & tortillas. Chicken breast & six shrimp with broccoli, onions & green bell peppers. Served with beans, rice & tortillas. A combination of rib-eye & chicken breasts with grilled onions, mushrooms & topped with melted cheese. Served with beans, rice & tortillas. Grilled chicken breast topped with grilled onions, mushrooms & spinach with cheese sauce. Served with rice, lettuce, sour cream tomatoes & tortillas. This chicken breast is fired up with our spicy diabla sauce. Served with beans, rice and three tortillas. 3 chicken enchiladas with rice, topped with lettuce, guacamole & sour cream. Grilled chicken breast, topped with grilled pineapple, ham & melted cheese; served with rice & tossed salad with pico de gallo. Chicken breast marinated in our special recipe then grilled, served with rice, lettuce, tomato, pico de gallo, cheese & guacamole. Chicken strips grilled with onions and jalapeños. Simmered in a yummy sour cream and mole sauce. Served with rice, beans, lettuce and tortillas. Chicken breast marinated, then grilled & tipped with grilled poblano peppers & onions, then covered with melted cheese & served with rice, beans & tortillas. Chicken strips grilled with pineapple and chorizo (Mexican sausage) topped with melted cheese, served with rice and tortillas. 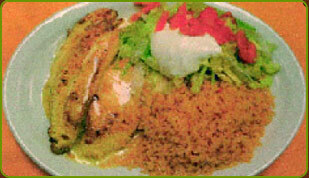 Grilled chicken or steak strips over a bed of rice, covered with cheese sauce. “Yummy”! A bowlful of juicy lettuce topped with grilled chicken strips, tomatoes & covered with “yummy” cheese sauce & sour cream. Tamal & Nachos with rice, beans, beef, cheese & chicken, topped with lettuce, tomato & guacamole, sour cream & 2 taquitos. Three grilled chicken tacos served with rice, beans & pico de gallo. Marinated grilled chicken breast topped with chorizo & melted cheese sauce. Served with rice, beans, lettuce, sour cream, pico de gallo & tortillas. An especially good dish of grilled chicken breast topped with shrimp covered with cheese dip. Served with rice, grilled onions, tomatoes & zucchini. Grilled chicken strips, pineapple, Mexican pork sausage & melted cheese over a flour tortilla. Served with Mexican rice, lettuce, tomato & sour cream. 3 soft corn tortilla tacos with grilled tender steak, served with beans & a side of pico de gallo. 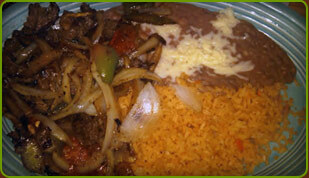 Rib-eye steak with sauteed peppers, tomatoes & onions, served with rice, beans & tortillas. Grilled Rib-eye, chicken enchilada, beans, onions, bell peppers, tomatoes, pico de gallo & tortillas. Rib-eye steak topped with six grilled shrimp & cheese sauce. Served with rice & guacamole salad. Tender roast beef with rice, beans, guacamole salad & corn tortillas. Grilled rib-eye steak served with rice, beans, guacamole salad top with ranchero sauce tortillas. Beef tips with red sauce, rice & beans, tortillas & guacamole salad. Served with mashed potatoes & a tossed salad. 3 cheese enchiladas topped with pork, cooked with onions & ranchero sauce. Served with rice, lettuce, guacamole & pico de gallo. Three soft tacos filled with mildly spiced Mexican sausage. Served with onions, cilantro, rice and beans. Chunks of pork grilled with green tomatillo sauce, served with rice, beans & tortillas. Fried pork with rice & beans, choice of salad & tortillas. Three soft tacos with deep fried tender pork. Served with pico de gallo & beans. Three soft tacos with deep fried tender pork with pineapple, chorizo & pico de gallo. 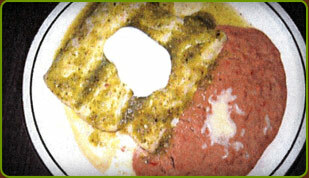 Two grilled pork chops with your choice of green or red sauce. Served with rice, beans & tortillas. Our special hot sauce gives these fourteen shrimp their own flavor. Served with rice, tossed salad & tortillas. Four grilled Tilapia Tacos with cilantro, chopped onions, tomatoes, a slice of lime & mango sauce. Juicy grilled Tilapia with six shrimp on top, covered with cheese sauce. Served with rice, tossed salad, fresh avocado & lemon. Ten shrimp grilled to perfection with onions & a touch of garlic. Served with rice, beans, avocado, tomatoes & three flour tortillas. Grilled shrimp & scallops over a bed of Mexican rice, covered with melted cheese & red sauce. Served with guacamole salad, tomato & sour cream. A crispy flour tortilla filled with melted cheese, beans, grilled shrimp, sautéed onions, bell peppers, and tomato. Finished with lettuce, tomato, cheese, sour cream and guacamole. Flour tortilla deep fried, stuffed with shrimp, crab meat, scallops & grilled onions, topped with cheese dip & our special sauce, served with rice & beans. (12) fresh shrimp topped with cheese, served with rice. Six breaded shrimp on a bed of rice, lettuce, pico de gallo & fresh avocado with lime. Six grilled shrimp, steak & chicken on a bed of rice with melted cheese on top. Ten grilled shrimp with rice covered with cheese dip & guacamole. Marinated Tilapia grilled with lime drops, covered with melted cheese. Served with rice, lettuce & tomato. Three soft tacos filled with grilled shrimp. Served with rice, beans, side lettuce and cheese. Flour tortilla grilled & stuffed with cheese, beef tips or chicken, beans & served with rice, lettuce, guacamole, sour cream & pico de gallo. 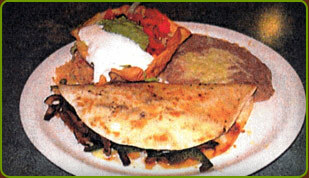 Our stuffed quesadilla with your choice of ground beef, beef tips, chicken or beans. Served with lettuce, tomatoes, sour cream & ranchero sauce. Thick flour tortilla stuffed w/grilled chicken or steak & cheese, covered w/our cheese sauce. Served with lettuce, tomato & sour cream. A 12″ flour tortilla with your choice of steak or chicken, covered with cheese & topped with lettuce, pico de gallo & sour cream. Served with rice & beans. Order of 2 burritos, one chicken & bean & one beef, topped with lettuce, tomatoes & sour cream. A 12″ flour tortilla filled with grilled chicken and steak. Topped with shrimp, chorizo, pineapple and melted cheese. Two burritos with beef tips topped with nacho cheese. Served beans, lettuce & sour cream. 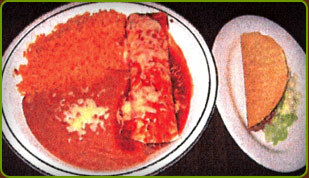 Two burritos served with rice and beans. An oversized flour tortilla, stuffed with rice, beans, lettuce, sour cream, cheese, tomato, choice of chicken or ground beef. Consisting of 2 burritos, beans & beef tips with red sauce, topped with cheese, lettuce, tomato, guacamole & sour cream. A 12 inch flour tortilla stuffed with ground beef & chicken, topped with lettuce, tomatoes & sour cream. Choice of rice or beans. 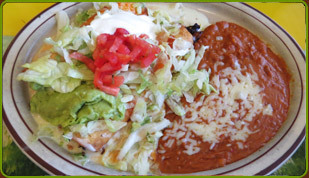 A 12″ flour tortilla stuffed with shredded pork & vegetables, topped with ranchero sauce, lettuce, guacamole & pico de gallo, served with rice & beans. Tender sliced steak or chicken cooked with bell peppers, onions & tomatoes; served with beans, rice, lettuce, guacamole, sour cream, pico de gallo & tortillas. 14 Shrimp cooked with bell peppers, onions & tomatoes; served with rice, beans, lettuce, guacamole, sour cream, pico de gallo & tortillas. 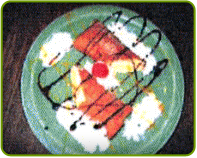 Tender strips of beef, chicken, shrimp and pineapple served in a halfed pineapple, all topped with shredded cheese. Comes with Fajita vegetables. Steak, chicken, pork and chorizo. Comes with fajita vegetables. Three flour tortillas with your choice of steak or chicken, cooked with onions, tomatoes & bell peppers then topped with shredded cheese. Served with rice, beans, lettuce, guacamole & sour cream. Grilled steak cooked with zucchini, onions, poblano peppers & tomatoes. Served with rice, beans, lettuce, sour cream, & tortillas. Steak, chicken and chorizo cooked with onions, tomatoes & bell peppers; served with rice, beans, lettuce, guacamole, sour cream, pico de gallo & tortillas. A tasty combination of chicken, steak and shrimp cooked with onions, tomatoes, bell peppers, pineapple and bacon; served with rice, beans, lettuce, guacamole, sour cream, pico de gallo & tortillas. Fresh shrimp, scallops ad tilapia, cooked with onions, tomatoes & bell peppers; served with rice, beans, lettuce, guacamole, sour cream, pico de gallo & tortillas. Tender steak, chicken & shrimp cooked with onions, tomatoes & bell peppers; served with rice, beans, lettuce, guacamole, sour cream, pico de gallo & tortillas. Grilled chicken, shrimp & Carnitas cooked with onions, tomatoes, mushrooms & topped with cheese. Served with rice, beans, lettuce, sour cream, pico de gallo & tortillas. Grilled strips of seasoned chicken, Mexican sausage, hame & pineapple cooked with onions, mushrooms & topped with spicy cheese sauce. Served with rice, lettuce, sour cream & tortillas. A combination of shrimp, beef & chicken Fajitas Carnitas, cooked with mushrooms, bell peppers, onions, red sauce & topped with cheese. Served with rice, beans, lettuce, sour cream, pico de gallo & tortillas. Steak, shrimp, chicken, chorizo and pineapple. Comes with Fajita vegetables. Bean burrito, cheese enchilada, tostada w/ beans & nacho cheese. Chalupa, cheese enchilada, rice & beans. Bean burrito, quesadilla & chalupa. Bean tostaguac, cheese enchilada & rice. Bean burrito with nacho cheese, cheese enchilada & quesadilla. Chile poblano, cheese enchilada, rice & beans. Two cheese stuffed poblano peppers covered with mole. Served with rice & beans. 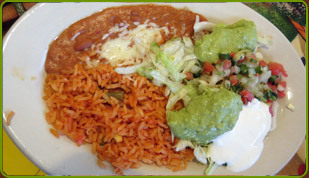 With onions, bell peppers, tomatoes, mushrooms and broccoli, topped with cheese dip, served with rice and beans. Cooked bell peppers, onions, tomatoes, mushrooms & broccoli. Served with rice, beans & salad. Stuffed with cooked bell peppers, onions, tomatoes, mushrooms & broccoli. Served with rice, beans & salad. Child's Plate - Children 10 & under only. Children 10 & under only. a thick flour tortilla topped with ground beef covered with tomato sauce & cheese. Ham & cheese quesadilla with fries. Creamy cheesecake wrapped in pastry tortilla, fried until flaky & dusted with cinnamon. Fried flour tortilla with honey, whip cream & cinnamon. *NOTICE: Consuming raw or undercooked meats, poultry, seafood or eggs may increase your risk of food-borne illness. Prices listed above are subject to change without notice. Add $.50 to all carry-out orders. Copyright © 2019. La Carreta II Mexican Grill & Cantina. All rights reserved.